Are You ready for insanity? The Insanity Workout is a 60 day high energy cardio blast that will shred the fat from your body and leave you lean and mean. If you're ready for an extreme workout, if you are ready to push yourself to the very limits of your physical and mental abilities, than the Insanity Workout will take you beyond your limits, and deliver a total body transformation that will astound you! No More Gym. Join The Insane Team! 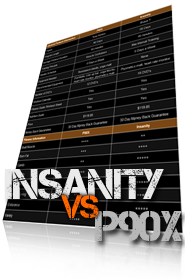 The reason the Insanity Workout has achieved such astounding results is because it was designed with the cutting edge of sports science principles in mind by former track star Shaun T. Deliberately paced to make this an extreme workout, Shaun T has taken the High Intensity Interval Training method and inverted it, creating his own monster version called Max Interval Training. Instead of working out as hard as you can for a short period of time and then resting, Shaun T set out to create a program that inverts that method so that you kill yourself for long beats and then rest for but 30 seconds. Do this for twenty five minutes of plyometrics, traditional cardio, calisthenics, sports drill and core work and you will be ready to drop. Buffer this insane workout with a killer warm up (regarded as many as harder than most other extreme workouts) and a cool down session, and you will be destroyed in under an hour. So if you want Insane results, if you want a total body transformation, and are willing to push yourself harder than you have ever done, then Insanity is for you! What's The "Fat Burning Zone"? Is Insanity The Right Workout Program For Me? P90X Workout vs the INSANITY Workout - Which One Is Harder? Both Insanity and P90X are extreme workouts, and somebody trying to find the 'toughest' will quickly realize that it's not a question of which is harder, but what each one delivers to the trainee. If you want to shed fat, become whip-cord lean and high energy, than nothing will challenge you and deliver results like the Insanity Workout. However, if you want to lose weight AND gain muscle, if you want to do a variety of different exercises from Yoga to Kenpo, if you enjoy longer challenges (P90X is three months), and feel like you have to lift weights to get a good workout, than you will enjoy P90X tremendously. Which is tougher? They're both tough—but each in their own unique way. Click Here to See The Comparison Sheet. The reason the Insanity Workout is so incredibly effective is because of Shaun T's workout technique, Max Interval Training. Traditionally, high intensity interval training involves workout for about thirty seconds as hard as you can, and then taking a longer break as you allow your body to recover. This is an incredibly effective way to burn fat, but Shaun T decided to push it to the next level: Max Interval Training. What he did was invert the work/rest durations, so that you work at extreme levels for long periods of time, and then have only a short break to recover. What does this do to your body? It pushes your heart rate way up and keeps it there. The Insanity Workout is based on four minute groups of four exercises, each of which you do back to back without a break. During those four minutes you will exercise in the anaerobic zone, forcing your body to turn to glycogen as you burn through a ridiculous amount of calories in no time at all. What is the anaerobic zone? Normally our bodies and muscles are able to get enough oxygen to perform whatever exercise we are doing aerobically. However, when you push yourself so hard that your body can no longer get oxygen to your muscles in time, you enter the anaerobic zone. This forces your metabolism to leap up in efficiency, and for you to turn to other sources of energy. That's why the Insanity Workout can help you burn up to a thousand calories per session, something that's unheard of in other workouts! Too many casual workouts rely on the myth of the 'Fat Burning Zone'. The reason Insanity does not follow this common wisdom and seek to keep you in that zone is because it simply doesn't deliver results. Have you ever been on a cardio machine and seen the different levels of intensity labeled different descriptors, with one of the less intense ones being the Fat Burning Zone? Well this is so called because when you work out at lower levels of intensity you operate aerobically and are able to burn fat, which sounds good except when you consider the low intensity level you are working out at. Think about it this way: the 'fat burning zone' will allow you to tap your fat stores directly while exercising aerobically, but most people will only burn a couple of hundred calories at such low intensity levels. A pound of fat contains about 3,500 calories. At the rate of a couple of hundred calories a day, it will take weeks to lose just one pound. Hard an effective way to go about losing weight quickly. Instead, the Insanity Workout pushes you into the anaerobic zone, forcing you to ramp up your metabolism and for your muscles to turn to other sources of energy. What happens is that your body will breakdown tissue in your muscle for energy, which sounds bad until you realize that your body's natural adaptive mechanisms will rebuild those muscles even bigger and stronger. The true benefit however lies in the release of hormones such as Human Growth Hormone that causes your metabolism to work more effectively and helps burn vast amounts of fat in the long term, allowing your body to look radically different in less time than you could believe. The Insanity Workout is correctly billed as the most intense workout on the market, capable of delivering total body transformations in only 60 days. This can sound incredibly intimidating to the average athlete, leading one to ask: is this Workout right for me? Does the very extreme nature of the workout mean that regular folks shouldn't even try it? No! The Insanity Workout is indeed an extreme workout, but you get to set your own pace. At first you may not go as fast or hard as Shaun T, but following as best you can, and always listen to him when he says to take breaks, to check in with yourself, to check your heart rate. If you push yourself as hard as YOU can go, then you will advance as fast as your body is capable. That means the Insanity Workout will deliver the best results for YOUR body, and even if you can't keep up, you are still changing as fast as possible. All you need to do is press Play, hang in there, and allow Shaun T to guide you through a total body transformation!